Having a podcast that’s loved by millions of people around the world is something that only a few podcasters manage. And even though these highly successful podcast shows are spread across different themes and tackle different topics, there’s one thing they all have in common. These highly successful podcasts are all brilliant at sharing stories. The ability for a podcaster to find the stories in the topic, guest and their own lives, and share them with their audience is the key element that builds a podcast people fall in love with. In a recent episode of Should I Start A Podcast, master storyteller Andrew Griffiths highlighted how important it is to find the stories that your audience will connect with. Andrew has written many successful books and has 12 bestsellers under his belt, and the one thing he focuses on above all else is the power of story. There are ways as a podcaster that you can find these stories and use them to bring your own show to life. One of the best ways to connect with an audience is to share stories that are raw, that challenge the way people think. When you make the point of finding ways for the guests on your podcast to go deeper and talk about their feelings on the situations they face, you create connections your audience will naturally attach themselves to. This is the same for you as a podcast host – the more you share your vulnerabilities and feelings on the topics you discuss, the better you will connect with your audience. Even though your audience engages with you through listening, they’ll easily be able to spot someone who is disingenuous. The stories you share on your podcast need to be authentic, and they need to come from either your own life or those of your guests. This doesn’t mean you can’t talk about things you haven’t experienced, though you need to approach those topics through your connection to them. The more authentic and real you are, the easier it will be for your audience to connect with you. A mistake that some podcasters make is sharing a story that’s interesting or incredible, but that has no relevance to the main themes of the podcast. There are interesting and incredible stories everywhere around you, but you need to find the ones that fit into your show. The last thing you want is your audience to tune in and connect with your show, only to be confused as to why you’re sharing a particular story with them. To have a successful podcast, you need to be a master storyteller that builds connections through the shared experiences of your guest and yourself. This approach will build connections and establish an audience that will return week after week. 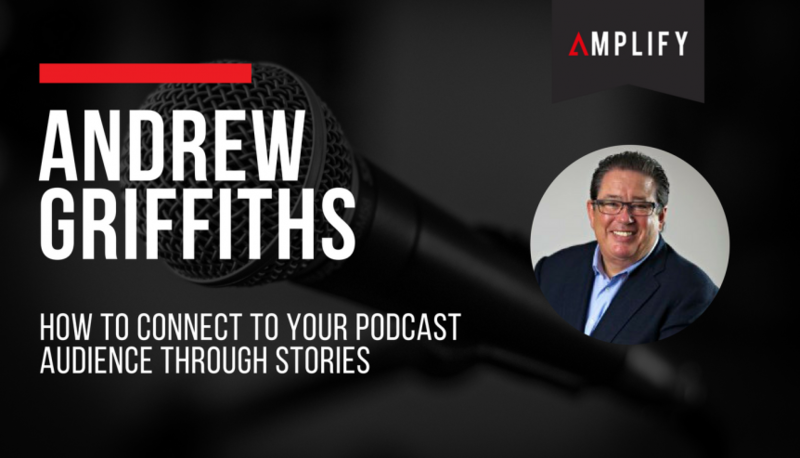 Listen to my entire conversation with Andrew Griffiths here.